As much as I love to cook, I love summer time because we prepare almost every meal on the grill. The cleanup is easier, you don't heat up the house, and the food just tastes like summer. We use our grill year round (even in the snow! ), but there is something about grilling in the summer that makes the food taste different. I was excited when I saw that this Taste of Home Cooking Recipe Swap was Grilling/Cookout Recipes. I was given a recipe for Thai Turkey with a Spicy Dipping Sauce from the blog Hezzi-D's Books and Cooks. We had just moved in to our new home when I was given this recipe, so I was excited to make it for our first meal cooked in the house. Turkey is something I usually only eat once a year on Thanksgiving, so I didn't even know that I'd be able to get it in the summer. I checked out my store and they had ground turkey and large turkey breasts that I didn't really want to portion and have a ton left over, so I ended up using chicken breasts instead. I liked that the recipe used both a rub and a dipping sauce - the bright lime and cilantro rub paired with the spicy and tart Thai chili garlic dipping sauce was seriously packed with so much flavor that Jon, my husband who loves bold and spicy food, thought it was too much! I do agree that the rub on the chicken was so good that you didn't even need the dipping sauce, but having the dipping sauce added another layer of flavors that I really enjoyed. I devoured this meal and will definitely make it again. 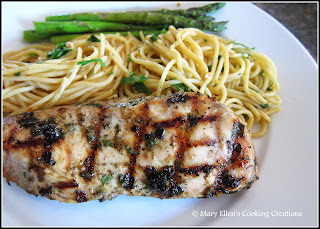 I served it with some grilled asparagus and these Spicy Sesame Soy Noodles. Combine the sugar and salt in a large bowl along with 2 quarts of cold water. Mix until the sugar and salt dissolve. Place the chicken/turkey in the brine and refrigerate for 1 hour. Remove the chicken/turkey from the brine, rinse with cool water, and pat dry. The dipping sauce: combine all ingredients in a small bowl. Allow to sit at room temperature for 1 hour to allow flavors to combine. The rub: combine all ingredients in a bowl. Use your fingers and mix thoroughly. 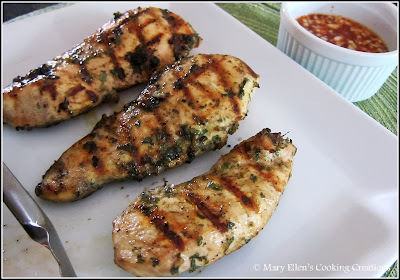 Using your hands, rub 2 tablespoons of the mixture on each chicken/turkey breast cutlet. Heat the grill to 400 degrees. 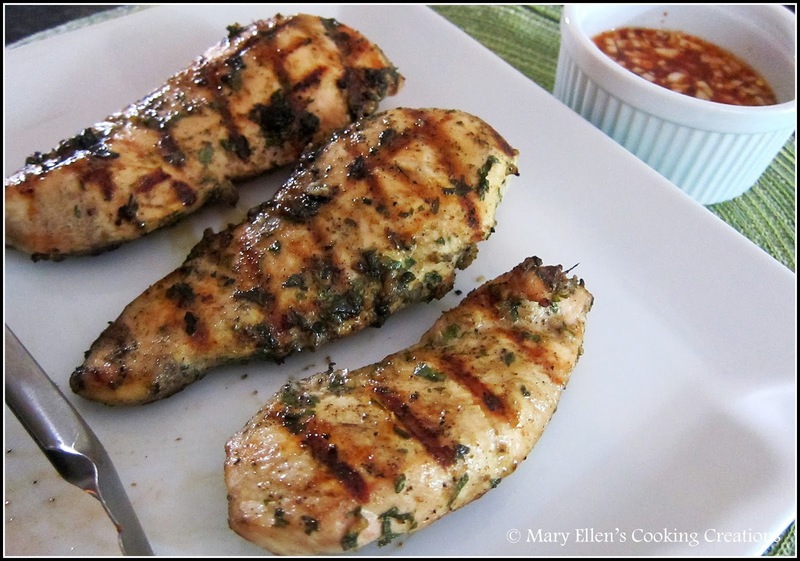 Cook the chicken/turkey cutlets for 6-7 minutes per side or until the internal temperature of the turkey is 160 degrees. Remove from the grill and allow to rest for 5 minutes before serving. Serve over rice (I served with noodles) with a side of the dipping sauce. That dipping sauce looks fantastic! This sounds delicious! I will have to add it to a meal plan. I'm so glad you liked it and I love the sound of those noodles you served with it! I'm definitely trying those next time around. We love rubs and dipping sauces! My son loves to "d d d" (dip dip dip) - must try this! Love the way these sound! I'm printing this off now to make soon. Looks incredible!